The world ended that day. With that phone call. That startling news.That deepening realization. The world ended that day. Or at least it ended as you had known it. I am so deeply aware of this right now for I am in the midst of a stretch of funerals. Some expected. Others not. All leaving those they loved living with a before and after like they have never known before. And yes, I say again, for each and all of them the world ended that day. Now I know, of course, that the ending Jesus points to in the temple today is a cosmic one, a final one, an only one, I suppose. And yet, it seems as though from the start of human existence there have been wars and rumors of wars, nations rising against nations and kingdoms against kingdoms. Once again, the news in these last months and weeks and days have been full of reports of earthquakes. And, yes, there is famine --- and at least the sort of hunger where the poorest among us are forced to choose between paying the rent and putting a meal on the table right here in my community and yours. These words roll around for us to ponder again and again and again. And still we are here. Clearly, with all of this struggle, the end is still not yet. This is why, I suppose, I fall to the temptation to bring this home. For yes, there are cosmic struggles all around us. At the same time, there are the wars and the battles and earthquakes erupting in our own hearts, our own families, our own neighborhoods, our own communities. And yes, we know endings, one by one, we surely do. What always puzzles me, though, is that Jesus inserts this amazing promise right here in the middle of all of these dire predictions. In the midst of that which we know brings death, there is this first inkling of life. At first it may be hard to imagine how this is even possible, but we know that it is. Let me tell you how I have seen this to be so even in these last days. I presided at a funeral this week of one who died too young. It was no secret to the hundreds gathered that he died at his own hand. The heartbreak the family feels is not new, though, for his struggle had been long and difficult. Indeed, I borrow now from a friend who traveled this path not long ago. When her family shared her brother's death with the world they said, "His death resulted from complications related to bi-polar disorder." And, oh, isn't that so. Indeed, while many of the details differ, still this was the journey this particular family had traveled as well. And so there was no pretending as we gathered for his memorial service. The heartbreak was named. And so was our hope which rests in God's love which is greater than our heartbreak, our struggle, our regrets, and our fears. I stood in our social hall afterwards visiting with friend and stranger alike. The room was emptying out when two women approached me --- friends of the family. They spoke to me then of how their lives had also been touched by suicide. Each of them had buried both a brother and father in the wake of such as this. Each of them. They spoke of their own journeys. They spoke of their love for their friend who travels this path now. And they wondered with me about what they might do next--- about how their experience, their pain, could become a gift to others who find themselves where they have been. 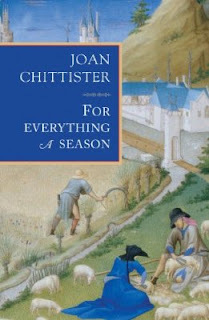 In the middle of this busy week I opened a book by Joan Chittister where she is reflecting on what are probably the most familiar words of Ecclesiastes: For Everything a Season. As this week had carried so much pain for so many I have encountered, I intentionally turned to her reflections on a time to weep. There she speaks the truth that it is hard to acknowledge the need for times of weeping. They are always unwelcome. But she also speaks of how our individual tears can open us up to the pain of the whole world and how in that way we are changed. Yes, such struggle can be 'the beginning of the birth pangs.' Yes, by God's power, even these can be the beginning of new life. No, indeed, for all of our effort and will we won't get the wars, the earthquakes, the hunger to stop. These will still be. And yes, we will still be those who weep in the wake of these, perhaps most especially those which affect our own lives. At the same time, you and I are called to be among those who recognize the new life that comes from even these. Indeed, might it be that you and I can even be the midwives who help make it so? How do you hear Jesus' words today? Is it fair to equate the smaller ways in which our worlds 'come to an end' with what he speaks of now? Why or why not? How is it that these things which are normally associated with death actually signs that new life is coming? Why does Jesus tie birth pangs to such as these? Where have you experienced the sorts of birth pangs Jesus speaks of now?